• Custom connectors can be created, Ask us! This video provides an overview of setting up the Microsoft Dynamics CRM connector feature in 12d Synergy. 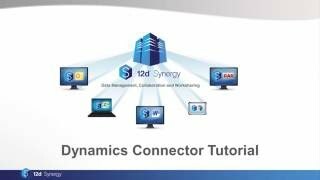 This video includes how to connect 12d Synergy and Dynamics, setting up the attribute mappings and how to run the connector. Data such as jobs, contacts, companies, tasks, documents and other information to be imported into 12d Synergy automatically as they are generated in Dynamics. The connector API allows you to connect 12d Synergy to your business’s other software products. Connectors automatically import information stored in other products – preventing double entry, saving time and reducing errors. Microsoft Dynamics is a customer relationship management (CRM) software application. You can read more about the application here. How does 12d Synergy integrate with Microsoft Dynamics? Once you have connected Microsoft Dynamics to 12d Synergy via the API connector, you set up which information to sync from Microsoft Dynamics to the relative 12d Synergy Job or location. The data which can be imported into 12d Synergy from Microsoft Dynamics consists of entities and fields. Entities include information such as clients, jobs and contacts etc. Fields include metadata such as name, created date, contact information such as email, phone number as well as any other custom fields. This data can then be mapped for storing from Microsoft Dynamics to 12d Synergy. Any changes to contacts or job information inside Microsoft Dynamcs can then pushed through to 12d Synergy. You can also choose which user in 12d Synergy the connector runs. This allows you to see which changes have been pushed from Microsoft Dynamics, improving your digital paper trail for QA.